Thread: FP Geeks and Pen Nerds, What's the Difference? Re: FP Geeks and Pen Nerds, What's the Difference? A pocket protector! What a perfect idea. I had forgotten all about those. Today that is. 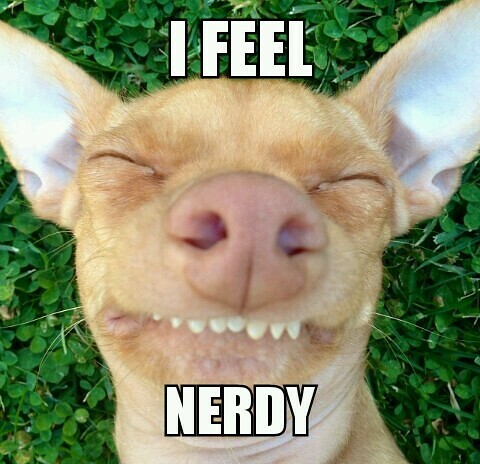 (Yes I just got a meme generator for my phone). PS: is the Obsession circle smaller than the other two or is it just an illusion? Are you obsessing over it? Heheh, only insofar as being a geek, not obsessed to the point of being nerdy. How about "pen geezer" for the more seasoned of us? LOL - I'll have to get myself a t-shirt with those exact words! First off, I'm late (habitually). While there has been nothing added since February I feel a need to comment. Yes I have a big mouth and frequently feel the need to comment. Nerds tend to be very well informed and studious on matters of personal interest. Geeks are Much More vocal and exuberant over their passions, hence the term "Geek out!" Nerds are content being the smartest person in the room (after all, they expect it). Geeks assume Everyone must be just as excited and into "it" as they are, so discussions quickly evolve into recitations of minutia to prove how devout they are. Nerds respond with "Yes. I am aware of these facts." Geeks reply with "OHMYGOD!! !AND THEY ONLY MADE 30,000 WITH THE RED TRIM!!! AND IF YOU LOOK AT THE ADD FROM SEPTEMBER '03 YOU SEE THAT ORIGINALLY IT WAS MAROON AND AFTER A WEEK OF PRODUCTION IT WAS CHANGED!!!" 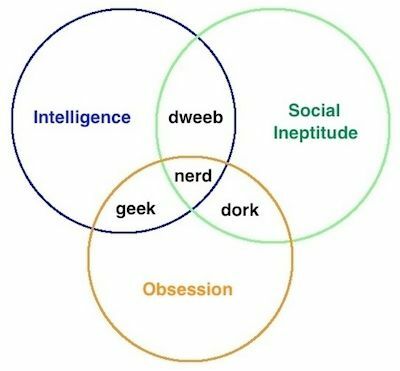 Nerds expect ignorance, Geeks expect everyone to feel as they do. Nerds assume you will never understand, Geeks think that with just a little more information you will be converted. I am proud to say I am some of both. If you have to ask which and when, then never mind. I don't think you will ever get it. In the circles I move the part of the Universal set S outside any of these sets in this Venn diagram would be labled "norm". Last edited by CaptainBlack; July 22nd, 2014 at 07:22 AM. "FP Geeks and Pen Nerds, What's the Difference?" - The same, the only variant is the depth of weirdness. It should be solvable with a couple of Fourier Transforms. A geek is someone who bites off the heads of chickens and snakes at carnivals, or used back when such things went on. I'm not exactly sure what the modern day equivalent would be. I suppose the modern equivalent ponders, wonders, and discuss online about a certain obsession that includes chicken engraved on the nib and snakes on the clip. Geek? Check out Tyrone Power in the film noir Nightmare Alley. His famous line when offered the job: "Mister, I was made for it." But hey, there might be a fountain pen in it. Last edited by FredRydr; April 11th, 2019 at 05:06 AM. Last night as I was pondering my own question, it occurred to me that television "news" anchors might be the modern day equivalent of those who used to bite the head off of live chickens and snakes for a living. And yes, there might be a fountain pen in it. Last edited by calamus; April 11th, 2019 at 11:13 AM. One of the darkest films that I can actually enjoy.